I was loathe to swap from my old Givi Monokey plastic panniers to flash new ones on my Tiger 1200. They would cost heaps, and store less. Well, pleased to say I've successfully fitted my Givi PLR6403 Monokey frames onto my T1200. I bought a pair of second-hand gen1 pillion hangers from eBay and fitted them in place of the originals. Cost me AU$50 including postage. They fit fine, onto the same fixings, and the footrests end up in the same place. -My pillion reports no change. I graunched (ie crudely adjusted) the long forward bottom bar of the right-hand carrier in a bit and down a bit, until the frame cleared the exhaust enough. Without adjustment, it was riding on the exhaust hanger. Now it has 1cm or more clearance. In the image below, you can see the unpainted gen1 pillion footpeg hangers, and the Givi rack fitted just like it would be on a gen1 TEx. The unpainted hangers look OK to my eye. There are a number of different colours on the bike, ranging from pure black, to the grey of the frame, to the chrome of the exhaust. A bit of raw aluminium doesn't look too out of place among them. -But then I'm not as fussy as some. Looks good to me, nice work. Top tip, if you buy genuine Triumph latch assembly T9500579 (thats the top box one) you can use the proper OEM luggage barrels you get when you buy the bike new.. also the latch is Triumph branded too, so on my Trekker Outback 58l box it looks properly nice! Givi manufacture the OEM triumph stuff, so its 40 odd dollars in the US to be able to carry one less key around.. Win! Here's all 3 part numbers for Left, Right & Top Triumph Latch assemblies in case any1 would like to use their Gen3 supplied luggage barrels on Givi Outback or Triumph Aluminium Luggage panniers. I have my 3 Givi panniers fitted with Triumph branded latches and fitted the ignition matched barrels i got with my bike. Those numbers WILL NOT WORK with gen 3 bikes as the locks are of a larger diameter. Top box needs T9500690 not sure of panniers but dealer should be able to advise. The secret of peace is not to avoid the rush and noise of the world but to live among the noise and rush and be calm yourself. Huge apologies.. i posted the latch part numbers for the 2017 bike. I'll edit my post and correct the part numbers to the 2018 latch part numbers. I have them on my 2018 XRT with the larger diameter provided locks fitted. Great to know, thanks for the clarification! I have to add a bit to this thread. This has probably come about because the rack's heat deflector was designed for the original TEx exhaust. 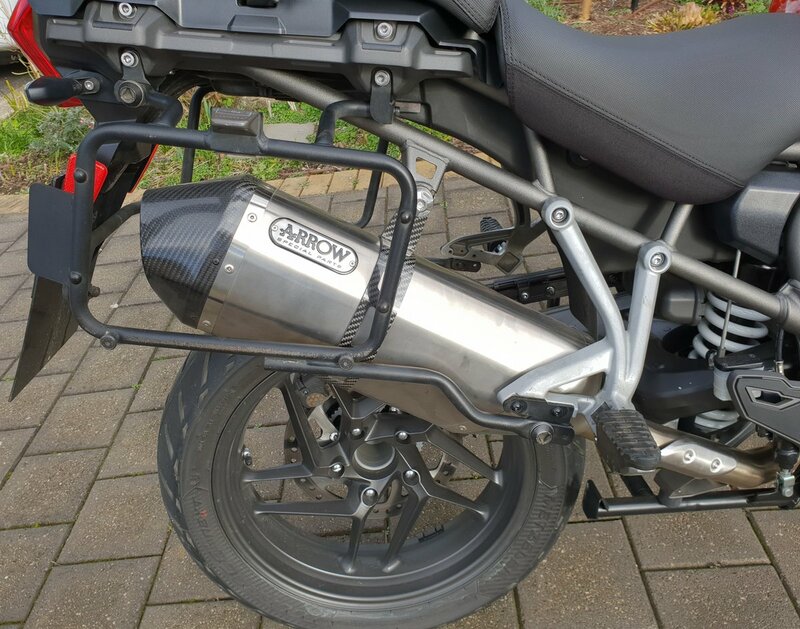 With the shorter Arrow exhaust on my T1200, evidently exhaust gas in front of the deflector is affecting the pannier. The correct fix would be to add more deflector plate to the rack, forward of the existing one. With me about to take off into the wild blue yonder, I'm taping a whole lot of aluminium tape over the affected area on the pannier. Might look a bit silly, but too bad.